Zeolites are crystalline solids structures made of silicon, aluminum and oxygen that form a framework with cavities and channels inside where cations, water and/or small molecules may reside. They are often also referred to as molecular sieves. Many of them occur naturally as minerals, and are extensively mined in many parts of the world finding applications in industry and medicine. However, most of zeolites have been made synthetically some of them made for commercial use while others created by scientists to study their chemistry. At present, there are 191 unique zeolite frameworks identified, and over 40 naturally occurring zeolite frameworks are known. Zeolites were introduced in 1954 as adsorbents for industrial separations and purifications. Because of their unique porous properties, zeolites are used now in a variety of applications with world production estimated to be in the range of 2.5 million to 3 million metric tons (Mt) in 2008 year . They are used in petrochemical cracking, water softening and purification, in the separation and removal of gases and solvents, agriculture, animal husbandry and construction. Zeolites are crystalline aluminosilicates with open 3D framework structures built of SiO4 and AlO4 tetrahedra linked to each other by sharing all the oxygen atoms to form regular intra-crystalline cavities and channels of molecular dimensions. A defining feature of zeolites is that their frameworks are made up of 4-coordinated atoms forming tetrahedra. These tetrahedra are linked together by their corners and make a rich variety of beautiful structures. The framework structure may contain linked cages, cavities or channels, which are big enough to allow small molecules to enter. The system of large voids explains the consistent low specific density of these compounds. In zeolites used for various applications, the voids are interconnected and form long wide channels of various sizes depending on the compound. These channels allow the easy drift of the resident ions and molecules into and out of the structure. The aluminosilicate framework is negatively charged and attracts the positive cations that reside in cages to compensate negative charge of the framework. 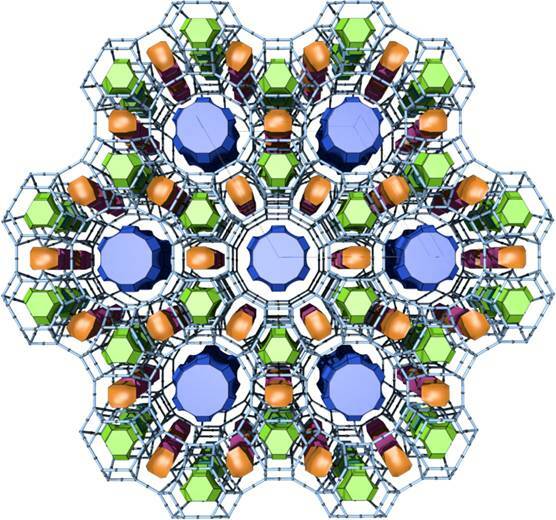 Unlike most other tectosilicates , zeolites have largeer cages in their structures. Zeolite-like materials have structures similar to zeolites but elements other than Si, Al and O can be present in them. For example, the isoelectronic substitution of 2Si → Al + P has led to the discovery of a wide range of AlPO structures [4-6] and related phosphate materials [7-8]. Considerable success have been done recently on making tetrahedral frameworks with the congeners of Al and Si in the next row of the periodic table, namely, Ga and Ge [9-14], and only recently the first chiral germanosilicate ITQ-37 has the been discovered with a zeolite-like framework consisting entirely of tetrahedrally coordinated positions occupied by germanium and silicon . Although hundreds of laboratories are trying to synthesize new materials with novel zeolite framework structures, only 191 zeolite framework types have been approved by the International Zeolite Association (IZA) Structure Commission (IZA-SC). The Atlas of Zeolite Structure Types published by the IZA Structure Commision assigns a three letter code to be used for a known framework topology irrespective of composition. The codes are normally derived from the name of the zeolite or "type material", e. g. LTA for Linde zeolites A, FAU for molecular sieves with a faujasite topology, e.g. zeolites X and Y, MOR for the mordenite topology, MFI for the ZSM-5 and silicate topologies. The more detailed information on topology of zeolites and related germanates compound is included in the Reticular Chemistry Structure Resource  and the Database of Periodic Porous Structures . The naturally occurring zeolites are an important group of minerals for industrial and other purposes . The discovery in 1957 of largedeposits of relatively high purity zeolite minerals in volcanic tuffs in the western United States and in a number of other countries represents the beginning of the commercial natural zeolite era. Prior to that time there was no recognized indication that zeolite minerals with properties useful as molecular sieve materials occurred in large deposits. Commercialization of the natural zeolites chabazite, erionite, and mordenite as molecular sieve zeolites commenced in 1962 with their introduction as new adsorbent materials with improved stability characteristics. The applications of clinoptiolite in radioactive waste recovery and in waste water treatment during the same period of the 60's were based not only on superior stability characteristics but also high cation exchange selectivity for cesium, strontium, and for ammonium ion. "Low-silica" or aluminium rich zeolites A and X (ratio Si/Al ≈ 1). Zeolites A (Fig. 1) and X (the most common commercial adsorbents) discovered by R. M. Milton at the Union Carbide Corporation Laboratories represent a fortunate optimum in composition, pore volume, and channel structure. 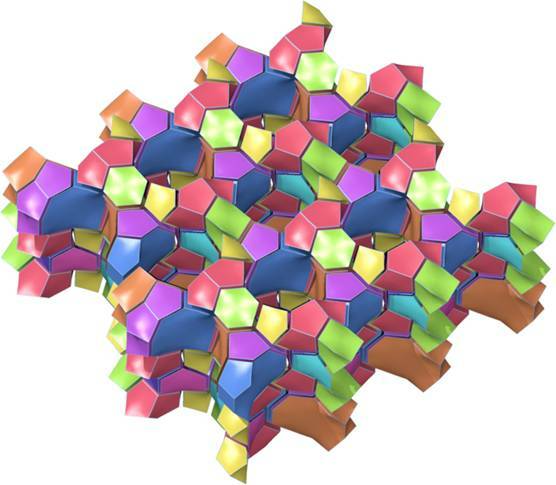 Both zeolites are nearly "saturated" in aluminium in the framework composition with a molar ratio of Si/Al ≈ 1, which is considered as highest aluminum content possible in tetrahedral alumosilicate frameworks. As a consequence they contain the maximum number of cation exchange sites balancing the framework aluminum, and thus the highest cation contents and exchange capacities. These compositional characteristics combined give them the most highly heterogeneous surface known among porous materials, due to exposed cationic charges nested in an aluminosilicate framework which results in high field gradients. Their surface is highly selective for water, polar and polarizable molecules which serves as the basis for many applications particularly in drying and purification. "Intermediate silica" zeolites: zeolite Y, mordenite, zeolite L, natural zeolites (ratio Si/Al = 2 ÷ 5). In the early 1950's it was recognized by Union Carbide Laboratories scientists that the tetrahedral aluminum positions in the zeolite frameworks provide a site of instability for attack by acid and water vapor of steam that make synthetic zeolites A and X less stable than their natural analogs, which have superior stability characteristics reflecting higher Si/Al molar ratio of 3-5. Therefore, zeolites with higher content of silicon were needed, primarily to improve stability characteristics, both thermal and to acids. The third commercially important molecular sieve zeolites type Y, with an Si/Al ratio from 1.5 to 3.0, and a framework topology like that of zeolites X and the rare zeolites mineral faujasite, represented the first successful discovery in that row of compounds made by D. W. Breck . Besides improvement in stability over the more aluminous X, the differences in composition and structures had a striking, unpredicted effect on properties making zeolites Y based catalysts valuable in many important catalytic applications involving hydrocarbon conversion since their initial commercial introduction in 1959 . Figure 1. 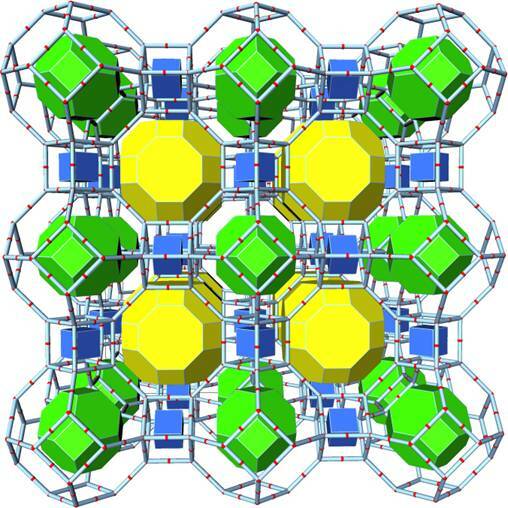 A representation of the zeolite A structure (LTA) as an assembly of framework's cages (tiles). Center of a tile is the center of a void in the framework. Voids are connected with adjacend ones through the large "windows" which are faces of tiles. The next commercially successful synthetic zeolite introduced in the early 1960's was a large pore mordenite (Fig. 2) with ratio Si/Al ≈ 5. The improvement in thermal, hydrothermal, and acid stability coupled with its specific structural and compositional characteristics resulted in application of mordenite as an adsorbent and hydrocarbon conversion catalyst . Type L zeolites (Fig. 3), discovered in the early 50's by D. W. Breck and N. A. Acara with a Si/Al = 3.0 have unique framework topology. They were adapted as commercial catalysts in selective hydrocarbon conversion reactions. Figure 2. The zeolite mineral mordenite (MOR): SiO4 polyhedra are represented as yellow tetrahedra; AlO4 polyhedra are aqua colored ones. "High silica" zeolites: zeolite beta, ZSM-5 (ratio Si/Al ≥ 10). The most recent stages in the quest for more siliceous molecular sieve compositions was achieved in the late 1960's and the early 1970's with the synthesis at the Mobil Research and Development Laboratories of the "high silica zeolites" . First in that row was zeolite beta (Fig. 4) discovered by R. L. Wadlinger, G. T. Kerr and E. J. Rosinski, and later ZSM-5 (Fig. 5) discovered by R. J. Argauer and G. R. Landolt. These are molecular sieve zeolites with Si/Al ratious from 10 to 100 or higher, with different surface characteristics. In contrast to the "low" and "intermediate" silica zeolites, representing heterogeneous hydrophilic surfaces within a porous crystal, the surface of the high silica zeolites is more homogeneous with an organophilic-hydrophobic selectivity . They adsorb stronger the less polar organic molecules and only weakly interact with water and other polar molecules. Figure 3. 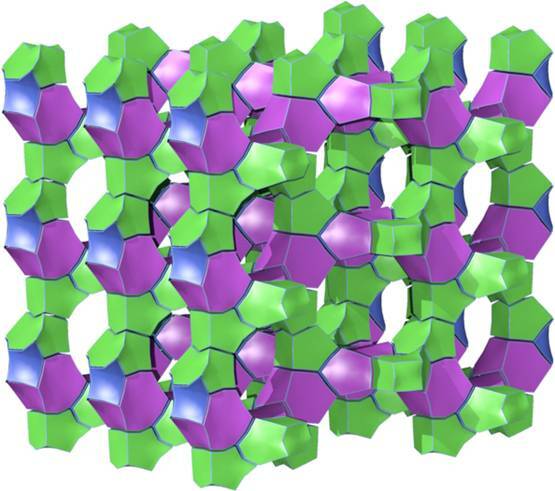 Tiling representation of the structure of the zeolite L (LTL). Blue tiles are channels in the structure running along direction of the crystallographic c axis. In addition to this novel surface selectivity, the high silica zeolite compositions still contain a small concentration of aluminum in the framework and the accompanying stoichiometric cation exchange sites. Thus, their cation exchange properties allow the introduction of acidic OH- groups via the well known zeolite ion exchange reactions, essential to the development of acid hydrocarbon catalysis properties. The properties of the porous materials depend both on the pore structures and the chemistry of the framework. The continuously increasing demands for materials with highly specific chemical and physical properties as zeolites have inspired scientists to make new porous materials with unique structures [11- 15]. Figure 4. Illustration of the channel system in the zeolite beta (BEA). Cation exchange properties of traditional aluminosilicate zeolites arise from the isomorphous positioning of aluminium in tetrahedral coordination within their Si/Al frameworks . This imposes a net negative charge of the framework (Si+4 → Al3+) counterbalanced by cations held within the cavities and channels. Ionic character of bonding between interstitial cations and the framework provide facile cation exchange for zeolites with open frameworks, where cations often readily exchanged for other cations in aqueous solution, though in some of the narrow-pored frameworks, such as natrolite, cation replacement is slow and difficult. Cation exchange is exploited in water softening, where alkali metals such as Na+ or K+ in zeolite framework are replaced by Ca2+ and Mg2+ ions from water. Many commercial washing powders thus contain substantial amounts of zeolites that enhance washing efficiency. LTA have the largest scale production of synthetic zeolites for use as "builders" in domestic and commercial detergents to remove the calcium and magnesium "hardness" . Figure 5.The ZSM-5 zeolite (MFI). The framework is represented by tiles assembly showing straight channels in the structure. The unique ion exchange properties of zeolites can also be used for cleaning up of commercial waste water containing heavy metals and nuclear effluents containing radioactive isotopes. In a similar way zeolites can absorb ions and molecules and thus act as a filter for odor control and toxin removal. Interstitial cations in zeolites can be exchanged to fine-tune the pore size of zeolites. For example, the sodium form of zeolite A has a pore opening of approximately 4 Å(4A molecular sieve). If Na+ is exchanged with the larger K+, the pore opening is reduced to approximately 3 Å; Ca2+ replaces 2 Na+, thus, the pore opening increases to approximately 5 Å. Ion exchange with other cations is sometimes used for particular separation purposes. Another potential application of zeolites is a drug delivery, when water in the structure is substituted by other liquid compound. Such treated zeolites act as a delivery system for the new fluid. Adsorption and separation are based on chromatographic processes which happen on the surface of zeolite crystals and are determined both by different migration speed of various compounds along the surface of adsorbent due to diversity in the intensity of their interactions with the surface and due to steric effects . The shape-selective properties of zeolites are the basis for their use in molecular adsorption. The ability preferentially to adsorb certain molecules, while excluding others, has opened up a wide range of molecular sieving applications. Sometimes it depends merely on the size and shape of pores controlling access into the zeolites; in other cases different types of molecule enter the zeolite, but some diffuse through the channels more quickly, leaving others stuck behind, as in the purification of para-xylene by the zeolites X or Y .
Cation-containing zeolites are extensively used as desiccants due to their high affinity for water, and also find applications in gas separation, where molecules are differentiated on the basis of their electrostatic interactions with the metal ions. Conversely, hydrophobic silica zeolites preferentially absorb organic solvents. Zeolites can thus separate molecules based on differences of size, shape and polarity. Zeolites are crystalline porous materials with pore dimensions in the same order as the dimensions of simple molecules; hence they possess molecular sieving properties when the shape and size of a particular pore system exert a steric influence on the reaction, controlling the access of reactants and products. In the case of shape-selective catalysis in zeolites, the combination of both properties exploited to control the selectivity of catalytically conducted reactions. Using zeolites as catalysts have many advantages since can be recovered and recycled with greater ease and low cost, leading to less waste and fewer byproducts, often function with higher activity, may combine several catalytic steps, reduce environment pollution by substitution of homogeneous catalysts used in the traditional chemical industry (mineral acids, salts, heavy metals). Hydrogen-exchanged zeolites, whose framework-bound protons give rise to very high acidity are exploited in many organic reactions, including crude oil cracking, isomerisation and fuel synthesis. Because of high selectivity of zeolites, they are often the most efficient and cost-effective method for a number of refinery conversions [19, 22]. Metal-exchanged zeolites can serve as oxidation or reduction catalysts, e. g. Ti-ZSM-5 in the production of caprolactam, and Cu-zeolites in NOx decomposition. They have been employed on diesel vehicles as a less costly and more effective option for NOx removal than the three-way catalytic converter. Zeolites find and increasing application in production of petrochemicals, often replacing environmentally unfriendly catalysts. Zeolite catalysts typically yield fewer impurities, have higher capacity, give greater unit efficiency, and afford higher selectivity. Unlike the more hazardous acid catalysts that have been used in the past, e.g., solid phosphoric acid, hydrofluoric acid, etc., zeolites are non-hazardous and regenerable. Content of the web page has been developed by Max Peskov, Stockholm University. F. Libau, Structural Chemistry of Silicates, Springer-Verlag, Berlin, 1985.
 . S. T. Wilson, B. M. Lok, C. A. Messina, T. R. Cannon and E. M. Flanigen "Aluminophosphate Molecular-Sieves - A New Class of Microporous Crystalline Inorganic Solids", J. Am. Chem. Soc. 104 (1982), 1146.
 . E. M. Flanigen, R. L. Patton, S. T. Wilson "Structural, Synthetic and Physicochemical Concepts in Aluminophosphate-Based Molecular Sieves", Stud. Surf. Sci. Catal. 37 (1988), 13.
 . M. E. Davis, C. Saldarriaga, C. Montes, J. M. Garces, C. Crowder "A Molecular-sieve with 18-Membered Rings", Nature 331 (1988), 698.
 . X. Bu, P. Feng, G. D. Stucky "Large-cage zeolite structures with multidimensional 12-ring channels", Science 278 (1997), 2080.
 . M. E. Davis "The quest for extra-large pore, crystalline molecular sieves", Chem. Eur. J. 3 (1997), 1745.
 . H. Li and O. M. Yaghi "Transformation of Germanium Dioxide to Microporous Germanate 4-Connected Nets", J. Am. Chem. Soc. 120 (1998), 10569.
 . T. E. Gier, X. Bu, P. Feng, and G. D. Stucky "Synthesis and organization of zeolite-likematerials with three-dimensional helical pores", Nature 395 (1998) 154.
 . T. Conradsson, M. S. Dadachov and X. D. Zou "Synthesis and structure determination of a high-porosity thermal stable germanate with a novel zeotype and 3D interconnected 12 membered ring channels", Micro- & Mesoporous Mater. 41 (2000) 183.
 . X. D. Zou, T. Conradsson, M. Klingstedt, M. S. Dadachov and M. O'Keeffe "A mesoporous germanium oxide with crystalline pore walls and its chiral derivative", Nature 437 (2005) 716.
 . X. Bu, P. Feng, and G. D. Stucky "Novel Germanate Zeolite Structures with 3-Rings", J. Am. Chem. Soc. 120 (1998), 11204.
 . Y. F. Li and X. D. Zou "SU-16: a three dimensional open-framework borogermanate with a novel zeolite topology", Angew. Chem. Int. Ed. 44 (2005) 2012.
 . J.-L. Sun, C. Bonneau, Á. Cantín, A. Corma, M. J. Díaz-Cabañas, M. Moliner, D.-L. Zhang, M.-R. Li and X.D. Zou "The ITQ-37 mesoporous chiral zeolite", Nature 458 (2009) 1154.
 . M. O'Keeffe, M. Peskov, S. J. Ramsden and O. M. Yaghi "The Reticular Chemistry Structure Resource (RCSR) Database of, and Symbols for, Crystal Nets", Acc. Chem. Res. 41 (2008), 1782 (http://rcsr.anu.edu.au/).
 . The Database of Periodic Porous Structures (http://mmkvk1.fos.su.se/).
 . Zeolites: Science and Technology. (Eds. : F. R. Ribeiro, A. E. Rodrigues, L. D. Rollmann, C. Naccache), Martinus Nijhoff Publishers, the Hague, 1984.
 . Zeolites for Cleaner Technologies. (Eds. : M. Guisnet, J.-P. Gilson). Imperial College Press, London, 2002.
 . Zeolites and Ordered Mesoporous Materials: Progress and Prospects. (Eds. : J. Cejka, J. Heyrovsky), Stud. Surf. Sci. Catal. 157, Elsevier, Amsterdam, 2005.
 . R. P. Townsend, E. N. Coker "Ion exchange in zeolites", Stud. Surf. Sci. Catal. 137 (2001), 467.
 . Catalysis and zeolites: fundamentals and applications. (Eds. : J. Weitkamp, L. Puppe), Springer-Verlag, Berlin, 1999.